Good morning, readers! It’s Monday, but I have good news! It’s Digit-al Dozen Week and the theme is Geometric. I’m still trying to brainstorm ideas for the week, but I suspect we will see lots of shapes, patterns, and lines from most of us this week. Today’s mani is what I’ve been wearing all weekend and I really love the color combo of the bright creme gradient over the darker shimmer quatrefoil pattern. I started out with 2 easy coats of Elevation Whoa! Jackson Whole. I topped it with 1 coat of KBShimmer Clearly On Top and let dry for a while. I painted Liquid Palisade around the nails for easier cleanup. 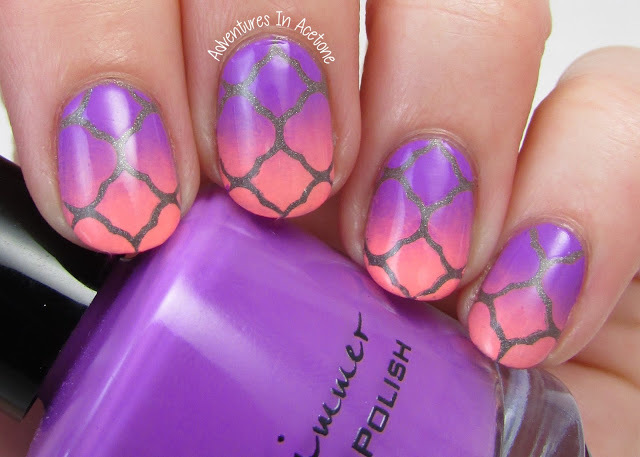 Then, I applied the Quatrefoil Nail Vinyls and pressed down firmly. I used a makeup sponge to apply the gradient of KBShimmer Sarong Place, Sarong Time and Bahama Drama. Once I was happy with the coverage, I peeled off the nail vinyls and LP. One coat of KBShimmer Clearly On Top was used to seal it all in and smooth out the gradient. What are your thoughts on this mani? I am really happy with the gradient because I was worried the colors I chose wouldn’t look nice blended together. I also love that the shimmery base is a nice contrast to the creme gradient. Thanks so much for reading, come back tomorrow to see my next Geometric design! Also, check out what the ladies did for Day 1 below! Yes! Finally someone writes about nutrition jobs.